Home to many people is a place that brings you joy or people that gives you comfort. We search for a community to belong to, seeking others to make us feel whole. Thailand for the past 3 weeks has been home to me and I think it will always be. Through the people I’ve meet, the organizations I have partake in, and the culture I’ve engaged with, I’ve reconnected with my identity and learned about cultures that I have fallen in love with. As a Hmong-American, I’ve struggled with my dual identity. Never feeling “Hmong” enough and not feeling “American” enough. In order to fit into the “American” culture I neglected my culture and was ashamed of it. I chose to not speak my native tongue: Hmong with my Hmong peers so that I wouldn’t be looked down upon. I chose to not learn about my Shaman religion and Hmong customs because I didn’t see a reason for it. Thailand changed it all. Pha Nok Kok Village was the first Hmong encounter I had on this trip. I had the honor to meet the Hmong people of this village and the opportunity to see their way of life. As I was translating and communicating with the Hmong elders, I realized how important language is. Language allows people to connect with one another. 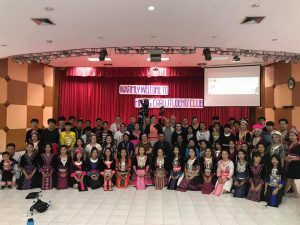 One of the student from the Hmong Club of Chiang Rai Rajabhat University said that “although we are from different parts of the world, one thing we have in common is our Hmong language because we’re able to feel a sense of familiarity with that”. Being able to translate and communicate with all the Hmong individuals I have meet on this trip has reminded me why it’s so important to know my Hmong history, culture, and language. Seeing different organizations such as the Karen Village and the Hmong Club of Rajabhat University working to preserve their indigenous culture has sparked me an interest of mine which is working with Hmong Organizations to preserve and educate our youth on the Hmong culture. There is richness in every culture. Thailand has allowed me to recognize the richness of my Hmong culture and all the cultures that we have encountered. 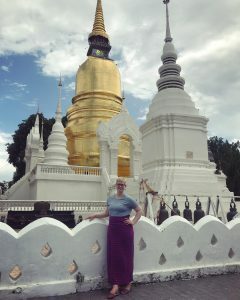 The past 3 weeks in Thailand have been pure happiness, learning, and warmth from those that I have encountered. 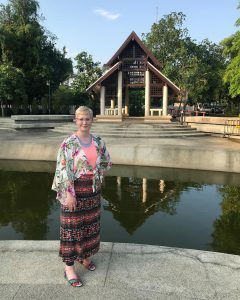 Thank you Thailand for allowing me to find reconnect with my identity and helping me discover a passion of mine. I know this won’t be the last time here. I used to think happiness was achieved when I made it to the American dream. Whether that included a big house, a happy family, nice cars, and exceptional vacations. I was happy before this trip to Thailand, I’ve been happy on during the duration of this trip, and I intend to be happy in the future. After talking with a monk named KK in Chiang Rai, achieving happiness in the future will be different from how I originally intended to find it. Western culture revolves around stress, long hours, and negative attitudes. Don’t get me wrong, there are many significant aspects of western civilization, but I feel like many people could benefit from the teachings of Buddhism. Initially, I thought Buddhism was a religion, and to only practice Buddhism, you needed to attend temples and to believe in its God. Buddhism is a way of life, and the key to this “religion” is finding the perfect balance. The ideal balance entails finding peace between your mind and body. Before this trip, I pushed the limits on working out some days and overly stressed myself out in school. However, at the end of your lifetime, what will matter most? Will it be the experiences that you’ve lived through, the people you surround yourself with, or the amount of money that you have? When you put that idea into perspective, the hours of stressing and working long hours of the day won’t matter when you’re laying on your death bed. Continuing, after that hour-long talk, I’m going to start achieving happiness a lot differently. I will try my hardest to have an excellent job to provide for my future family, but I will also prioritize myself also. Meditation will solely be the reason for this difference. During high school and my first half of college, my mental health and focus was never a priority. Now, when life becomes too overwhelming, I will meditate. It was the critical teaching that KK touched on and I never truly realized the importance of it. Along with meditation, KK also informed us of the idea of suffering. Before, I would do anything in my power to avoid pain. I also hated the idea of death and fearing those that I’m closest to, passing away. But death is a part of life, and it’s important to learn how to accept it. That doesn’t mean that you can’t be sad about the person passing away, but it’s important to understand that death is a way of life. Trust the relationship that you have with that person and remember the memories that you have with them forever. Lastly, KK talked about the idea that you can’t dwell on the past, you need to accept that it happens and move on. Hearing this statement brought me back to the times in high school where the most unimportant event occurred, and I would act like the world is ending. My dad would always tell me that I was focusing on something that was in the past and that there was nothing in my power that could change it. You can only control the future and trust that your good intentions and values, will bring you wisdom in those hard times. There is just no need to focus your time and energy in those times, and they won’t matter when you’re at the end of your life. Going forth, I will focus on the positives in my life and not dwell on the past. Overall, these few teachings that I learned from Buddhism will help guide my future to everlasting happiness. I’m determined to return back to America with a new mindset in life, that will help focus my energy and time to what is essential, and I couldn’t be happier to learn this in Thailand. Truly a memory that will last forever and will ultimately change my life, eternally thankful. 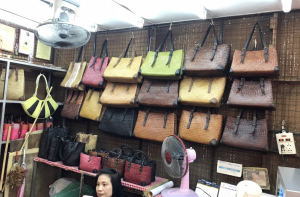 We were lucky enough to visit two villages in Thailand: a Hmong village in Chiang Mai and a Karen village in Chiang Rai. Looking back on these two separate occasions, I really admire the preservation of their cultures while being away from home. In both cases, the villagers lived in the mountains and were surrounded by people of the same culture. Seeing these villages made me understand the struggles of what it could be for a culture to immigrate and start acclimating into another culture. 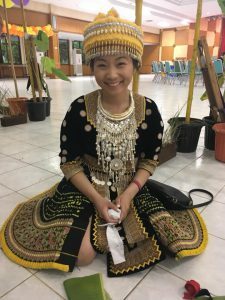 The Hmong culture originated from China and they are now having to adjust their life in thailand while keeping their traditions alive. It was interesting to hear how in both villages, the villagers are worried about the younger generations. It’s typical for the younger students to go the university in the city in order to get an education that can help them earn money in a job. It was really cool hearing the perspective from the elders because they are scared the younger generations won’t come back to the village and therefore lose their primary culture/tradition. Yet, I was interpreting that the reason the children leave is to help support their families back in the village. I took this as contradictory viewpoints. 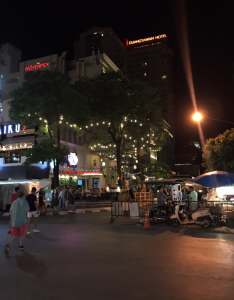 It seems like there is a lot of pressure on these kids to acclimate to Thai culture while still staying true to their home culture. I really clicked with visiting these villages because I was comparing my grandmother’s experience when she immigrated and how it was for my mom to balance these two cultures. My grandmother spoke only in Greek to her and expected her to work with my grandpa at his restaurant, yet my mom wanted to venture out and explore other things like sports, for example. While these scenarios aren’t the same, the balancing if cultures really stuck out to me. 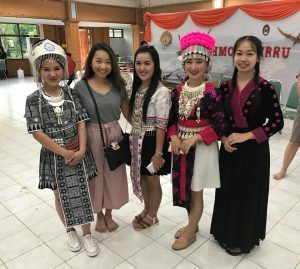 Seeing two of my Hmong classmates interact with their native culture in Thailand., made me really appreciate those who integrate two cultures. I think it’s so important to stay true to who you are, but it’s also so impressive to see how these people manage these expectations from both sides. I think this resonates with current immigrants in the US. Immigrants who come to the US are already expected to know some English and completely acclimate to the western culture but also want to keep their native culture alive while being in the States. It really is such a difficult thing to accomplish: the balance. Seeing these villages made me appreciate how much they hold onto their native culture because there is a huge push to westernize or to conform to the country’s culture. I loved seeing their traditions and daily life rituals that makes their native Hmong or Karen cultures so powerful! 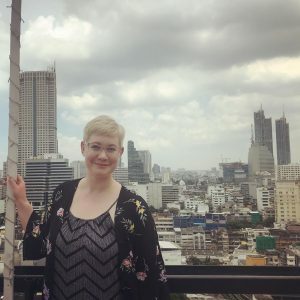 I have been really interested in learning more about what special education looks like in Thailand and seeing how it compares to my knowledge of special education in the USA. 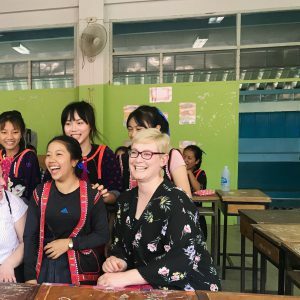 It’s been really interesting to go to the various schools so far in Thailand and ask them about how their special education system is set up. I have been surprised at the variety of answers of how schools work with special education and students with disabilities. So far, I have found that students with special needs and disabilities in general are worked with differently in Thailand and the USA. 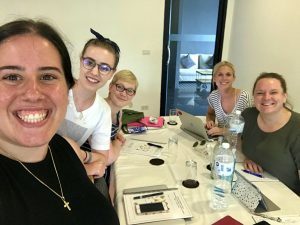 When I asked more specific questions at schools, there seemed to be a disconnect of the definition of disability. From my understanding, how they view disability is more on a physical level than a cognitive level. It has been a little frustrating that some of the question I have tried to ask have been lost in translation in a way. There just seems to be a disconnect when I ask about the special education supports in schools. The first school we went to was the welfare school and when I asked them about special education, they said that they do not really have any students in special education. They said that when students are slower learners that they will spend extra time with the teachers after school to work on the subjects they need help with most. The second school I inquired about was the school in the Hmong village we visited. 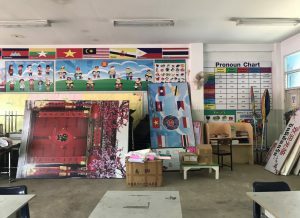 When we talked to the chief of the village, he said that students born in the village with physical disabilities are often sent to specialized schools in Chiang Mai where they can receive the individualized supports they need. The third school I ask about was in the Karen village. I asked our host from the Hill Area Development Foundation about the supports in the village elementary school and what she told me was that they don’t really have special education in the village elementary school. She also mentioned that if a student has a physical or severe cognitive disability, that they will not even go to school but rather stay home and their families will take care of them. Sometimes these children will learn a trade or help their family around the house but will not compete a formal education. 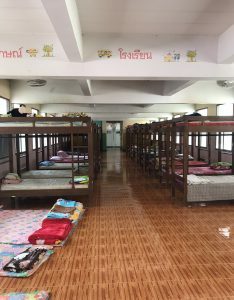 So far, I have noticed that the special education systems in Thailand does not seem as developed as the systems in Minnesota. I do recognize that Minnesota is well known for being a leader in special education and special education research. However, I have been surprised at the seemingly lack of supports in place to help students, specifically in smaller cities and villages. I am curious to visit more schools and see how the special education systems and supports look in those schools and comparing that to what I have seen and observed so far. Today was our fourth day in Thailand, and the first few days were full of exciting new experiences. One of my favorite parts of the trip so far has been the food. Trying new Thai dishes is one of the things that I was the most excited for before leaving for this trip. The food has been different than I expected, but I am enjoying it a lot. 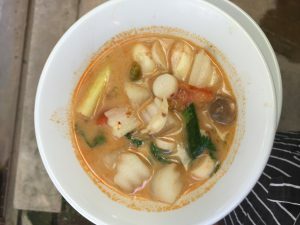 Yesterday we had the chance to learn more about how Thai food is prepared at a Thai cooking school. 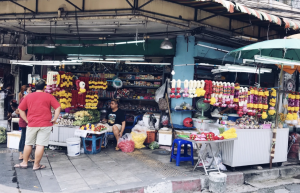 We began the day by going to a market to learn about how people purchase food in Thailand. 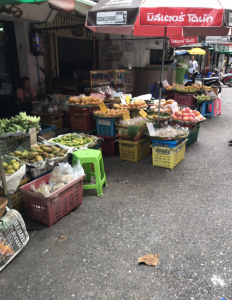 We learned that Thai people generally go to the market each day to get fresh ingredients for the meals that they will prepare that day. I found this interesting, because it is very different from how people go grocery shopping in the United States. We saw how milk is extracted from coconuts. This was interesting because coconut milk is a huge part of Thai cooking. 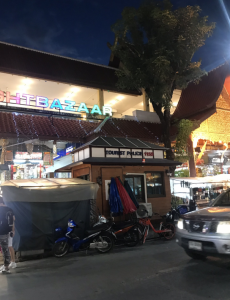 We had the chance to explore the market, and learn about how different types of food are selected and used for Thai cooking. 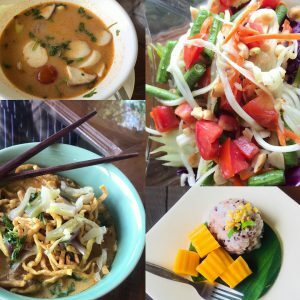 After the market, we went to the cooking school where we prepared four dishes: a soup, a papaya salad, a noodle dish, and sticky rice with mango. It was all fun to prepare and delicious to eat. One of the things that stood out to me the most during this experience was how fresh the food was. One of the owners of the cooking school mentioned that some of the ingredients come right out of her backyard. After learning that Thai people generally pick up fresh food each day, I was not surprised by how fresh the food that we cooked tasted. I have enjoyed this aspect of Thai food a lot. On the other hand, I have also noticed a lot of fried food. 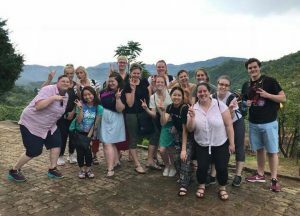 We’ve had fried bananas, fried rice, fried dough, etc… Don’t get me wrong – the fried food is delicious too, but it’s very different from the fresh food that we prepared at the cooking school. Over all, I am enjoying the dishes that we are trying here whether they are coming out of someone’s garden or out of a deep fryer.